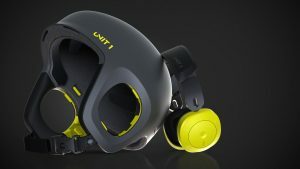 Denver, CO – UNIT 1 launches their Indiegogo campaign today for SOUNDSHIELD, a sports helmet with integrated wireless headphones. Starting at $130, SOUNDSHIELD’s clever design eliminates the issue of an audio kit or earbuds slamming uncomfortably against your ears and helmet while skiing, snowboarding and skateboarding. Even better, the headphones can be used independently from the helmet – just dock the headphones into the helmet when you need protection, and click them out when you just need sound. SOUNDSHIELD headphones come with a built-in microphone, and can play up to 16 hours of music. It has an intuitive single button control and a volume dial on the headphones for easy use and accessibility, and can even be used while wearing thick gloves or mittens. No apps, no wires, and no hassle. The headphones use Bluetooth 4.2 and are IPX4 sweat-proof and splash resistant, and the helmet is designed in compliance with EN1077, EN1078, ASTM 2040 certifications. “We wanted to give people the option of having their sports equipment integrated into their everyday life. Nobody wants to buy a product you only use for a few weeks in the year, so we’re looking forward to giving our backers something of value, that they can enjoy and experience year-round,” explains Javier Bertani, Co-Founder and Product Manager at UNIT 1. “Sports enthusiasts should be able experience music safely as they shred, ride or roll. Being able to offer people the perfect blend of design and functionality, with a product that fits both the everyday and the extreme, is something we’re hoping the Indiegogo community can really get behind,” adds Juan Garcia Mansilla, Founder and CEO for UNIT 1. SOUNDSHIELD is the first in what is set to be a range of products from UNIT 1, and can be supported on Indiegogo now, starting at $130.